Railpictures.ca - A.W.Mooney Photo: The CP has sold off a few locomotives as of late; 25 of them reportedly going to Larry’s Truck and Electric of Ohio (LTEX), and they have been filtering their way down from the North to Welland this past couple of weeks. From what I gather, in most cases 246 brings them down, sets them off in the yard and in a day or three, 254 takes them Stateside. Here is an example; CP #246 with 6247, 8868 is about to back into the yard and set off DME 6362, ICE 6214, and DME 6083. These warriors are somewhat worn out: The 6083, a straight SD40, was built in 1966 as CP 5503. The others, both SD40-2s, ICE 6214 began life as CP 5682(1974)and DME 6362 once was MILW 198:2 (1974). What happens to them at LTEX is anyone’s guess. I should add here that I know this is actually the community of Wainfleet lands, as the Welland city boundary extends only to a couple of KM to the East; but in all the years of being out along the tracks I have never heard this referred to as “Wainfleet Yard” so I continue to refer to the area as “Welland”. We argue political correctness, now we can argue ‘geographical correctness’. :o) And I further add; out of 612 contributions, this is only my third digital. Thoroughly Modern Mooney? Not yet. | Railpictures.ca – Canadian Railway Photography – photographie ferroviaire Canadienne. 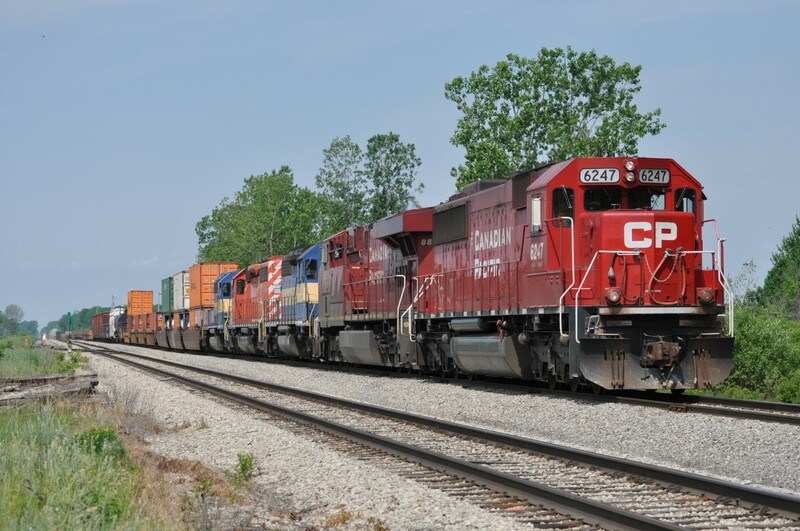 Caption: The CP has sold off a few locomotives as of late; 25 of them reportedly going to Larry's Truck and Electric of Ohio (LTEX), and they have been filtering their way down from the North to Welland this past couple of weeks. From what I gather, in most cases 246 brings them down, sets them off in the yard and in a day or three, 254 takes them Stateside. Here is an example; CP #246 with 6247, 8868 is about to back into the yard and set off DME 6362, ICE 6214, and DME 6083. These warriors are somewhat worn out: The 6083, a straight SD40, was built in 1966 as CP 5503. The others, both SD40-2s, ICE 6214 began life as CP 5682(1974)and DME 6362 once was MILW 198:2 (1974). What happens to them at LTEX is anyone's guess. I should add here that I know this is actually the community of Wainfleet lands, as the Welland city boundary extends only to a couple of KM to the East; but in all the years of being out along the tracks I have never heard this referred to as "Wainfleet Yard" so I continue to refer to the area as "Welland". We argue political correctness, now we can argue 'geographical correctness'. :o) And I further add; out of 612 contributions, this is only my third digital. Thoroughly Modern Mooney? Not yet. Arnold shooting with a digital camera???? What has this world come to???????? Snake: I have a Ford FLEX that is not quite 3 years old; has already 115,000KM of almost all train searching (after all, I do not work any more)so I guess I have to be modern in some ways. Todd: Wisdom ?? Don’t drink and drive. ) Actually, I go to YOU guys for wisdom in this digital age. Second digital shot was that Schnabel (CEBX-800) move in 2010 posted last year I think. Shot with a little Kodak Easy-share. It was only so-so. Hope to see you at the CNET Bayview shoot in a little over a week…and hoping you can pass some wisdom on to an eager learner Great shot! BTW…what was your second? I remember your seeing your first digital contribution…missed the second somehow?